Hohoho! 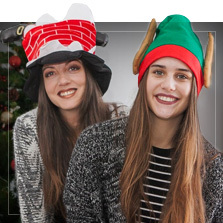 If you are one of those people that likes to make the most of any occasion to dress up and you have serious Christmas fever, you will love our Christmas costumes. 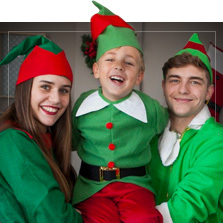 A wide catalogue of Christmas costumes for kids and adults so that you can dress up as your favourite Christmas character: Father Christmas, Elves, little shepherds, Christmas star, Wise Men, Virgin Mary and Joseph costumes and accessories to give a Christmas and festive touch to your look on Christmas Eve or to your New Year's Eve outfit. We even have Opposuits for you to be able to be elegant and christmassy at the same time! If you want to give a Christmas gift we have many ideas for you to surprise who you want to from costumes for children to a lot of fun nerdy merchandise. If you want to celebrate Christmas in style we recommend our collection of Christmas decorations. Tablecloths, cups, serviettes and the most fun adornments so that the whole world will always remember that your Christmas or New Year's party was "the bomb". Blow the dust off your Christmas carol CD, tune the tambourine and dress up in the most original Christmas outfits! Includes: bag with decorative cork dust. Includes: pine needle sprig, 50 cm. Includes: mistletoe branch, 110 cm. Includes: frosted Christmas sprig, 60 cm. Includes: Christmas sprig, 54 cm. Includes: clear Christmas bell decoration with multicolored LED light, 9 cm. Includes: 4 m fairy lights with 50 multicolored LED lights and 8 function controller. With 220V power plug. Includes: 5.5 m string lights with 240 white LED lights and 8 function controller. With 220V power plug and low-voltage transformer (12/24V). Jingle bells, jingle bells...! As Christmas gets closer we can only think about singing Christmas carols and sharing joy. And there is nothing more happy and fun for those days than a good Christmas costume. Everyone will be jealous of your great Christmas spirit! Christmas costumes for children, babies, adults and also for your pet! We have original Christmas costumes of Father Christmas, elves, Christmas trees... and also some of the more traditional ones like the little shepherds or Wise Men so that you can build your very own Nativity Scene. We want you to enjoy this Christmas like never before and that is why apart from these original Christmas outfits we have the best decorations for your Christmas party. If you are looking for ideas for Christmas presents... we have what you are looking for! Costumes to give as gifts to the littlest members of the house of their favourite characters and films: Star Wars, The Avengers, Ladybug and PJ Masks, Disney Princesses... We also have original geeky gifts for that special person you love and that is a bit of a nerd when it comes to the cinema, series or video games.